Yesterday, when I mentioned that the Puritans on the Mayflower could have avoided all their problems by hiring professional movers, maybe you rolled your eyes. How avoidable is that whole scurvy thing, right? I mean, how hard is it to pack a little Vitamin C? The thing is, I have total sympathy for those colonists. Yeah, in hindsight, packing some Tropicana seems like a total no-brainer. But what I'm saying is that sometimes no-brainers are the very things you leave off your packing list. For example, shower curtains. I mean, when you're packing to move into your empty apartment, what do you make sure you have? Phone charger, toothbrush, and underwear, I bet. I don't believe that anyone thinks, "Can't forget the shower liner." In fact, I wouldn't trust a person who did. 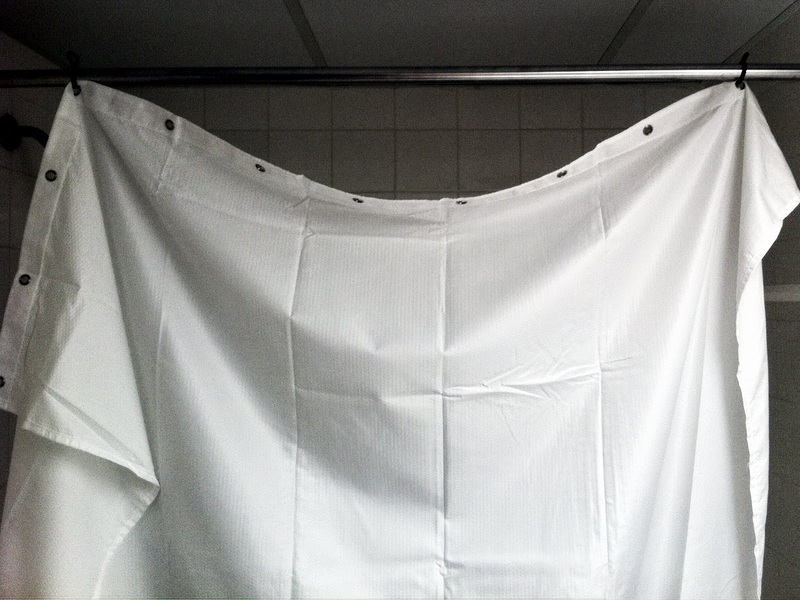 But when you turn on the shower at 6:30 AM, suddenly a shower curtain seems like a no-brainer. I mean, you knew you were going to shower at one point and the curtain is sort of vital to the whole operation. Yet, that's exactly what I forgot. It's amazing really, how one simple oversight can turn something as simple as a hot shower into mayhem. As I tried desperately to keep my shampoo rinse from spraying the whole bathroom, I was thrown back into memories of teenage, babysitter Nicole, trying desperately to change a baby's diaper as a two-year-old blissfully sprayed the kitchen with rainbow sprinkles. Needless to say, my very first home goods purchase in Arlington was a white vinyl shower curtain liner from Target. And just like my forefathers on the Mayflower, every new obstacle becomes a learning experience. Lesson learned this time around: "metal enforced rings" in shower liner lingo does not mean "shower curtain hooks optional." You still need 'em. Fortunately for me, my mistake could be fixed with a couple of extra hair-ties. So cheers, Mayflower pilgrims. I toast my OJ to you.